This guide will explain how to get started tracking data from your community or forum to Segment. As soon as you’re set up, you’ll be able to turn on any new integrations with the flip of a switch! If you need some inspiration before you start, check out our blog to read how GrowthHackers.com used Segment to analyze their community metrics. Below I’ll outline the key events most community managers use to measure engagement. There are always more events you can track, but I recommend starting with 3 from the list below. Later, you can expand your event library to include all the events listed. In this guide I use the Object-Action framework for planning events. 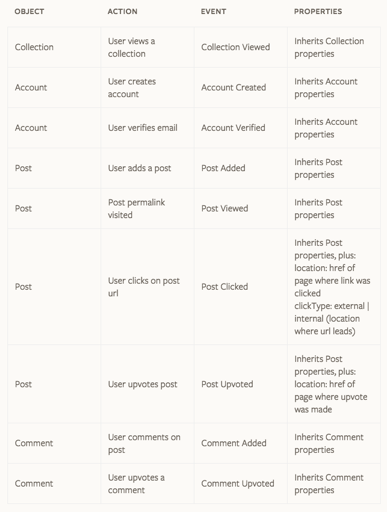 That means I’ve listed the most important objects that are being acted on by users, the properties that define those objects, and the actions that users can take on the objects. Putting the objects, properties, and actions together forms the events and event properties. These are the main objects that community members can take action on. All the events in this guide will be based on these objects. Under each object you’ll see the properties that define it. Those properties will be collected with all events that include the object. 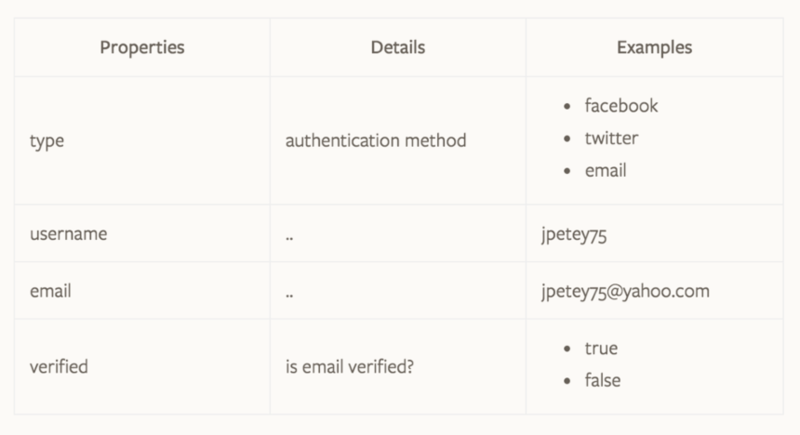 Below are the key events you’ll want to track based on the important actions users take on the objects listed above. Most of the events inherit their properties directly from the object, but sometimes there are custom properties. Once you’re tracking these events and properties you’ll be able to do all kinds of analysis on how people engage with your community. Below are a few important community metrics that can be calculated with the events and properties above. The top of your funnel is likely to involve new visitors looking at collections, then some portion of those visitors will create an account, and hopefully become engaged community members. Depending on your community these engagements may or may not be great signals of engaged users. For example, a user might be adding a lot of posts, but maybe they are all just pointing back to his own site. Or another user might be commenting a lot, but maybe all his comments are promoting his consulting service. One of the most important goals for communities is retaining their members. All of the events above can be used to measure retention (outside the Account events). The quickest way to get started is to use a tool with Cohort analysis. Most of the Analytics tools on the Segment platform have that type of report built in. Another way to look at retention is to measure sessions. Many analytics tools also do this out of the box, but if you’re using Segment Warehouses, you can use SQL to define sessions within your raw data. Most upvoted submitters: Count of all Post Upvoted events grouped bysubmitterUsername, ordered by upvotes. 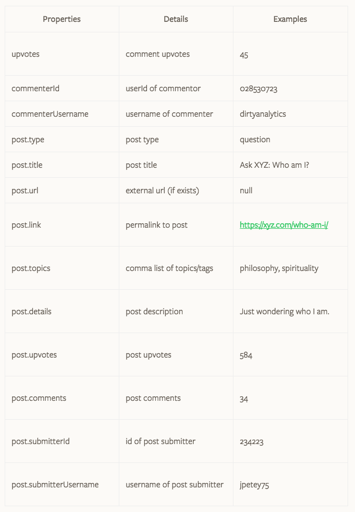 You can also group this again by title to see if the submitters added one very popular post, or many average performing posts. Most upvoted Commenters: Count of all Comment Upvoted events grouped bycommenterUsername, ordered by upvotes. Most commented posts: Count of all Comment Added events grouped bypost.title ordered by post.upvotes. 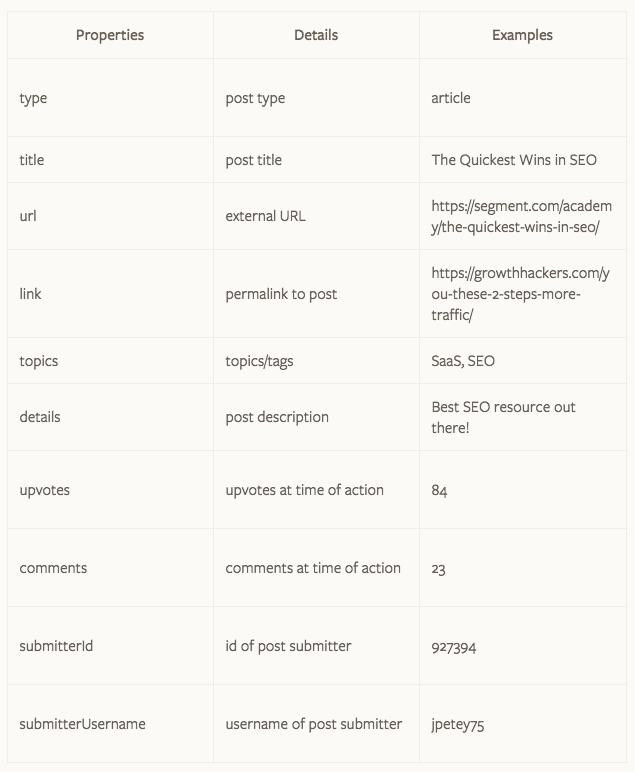 Most upvoted topics/tags: Count of all Post Upvoted events, grouped by topics, ordered by post.upvotes.